Installing new flooring is a big decision. Because the floor is often the largest uninterrupted space in a room, the look and feel of the flooring can set the tone all by itself: is this a warm room, or a cool one? A place to hang out and relax, a place to eat, or a place to work? On top of this ability to dominate the mood of a room, the installation of new flooring is often a time-consuming and expensive project. Generally, disciplined and thoughtful homeowners choose flooring options with the intention of keeping it for many years. No one wants to hate something they’re going to look at for the next decade, so below, you’ll find a list of the best flooring ideas for the year, along with a rough estimate of how much each type of floor would cost to install. Hardwood flooring is one of the hottest flooring options this year, even in places where you wouldn’t traditionally see wooden floors: for instance, wood flooring has become the most popular kitchen flooring choice. This is especially the case for open layouts, where consistent flooring between the kitchen and living area helps the space to flow seamlessly. There are a wide variety of hardwood options – from traditional hardwoods like oak, noted for its timeless beauty; to the newly popular bamboo, a renewable resource that is twice as hard as traditional woods; to the oh-so-trendy reclaimed wood, as famous for its unique look as it is for its sustainability. The most popular choices this year are darker in color, gray, or otherwise aged-looking, as more and more people go for a vintage or rustic-inspired look. Pros: Wood is beautiful and naturally warm, and can be sanded and refinished when damage is an issue. 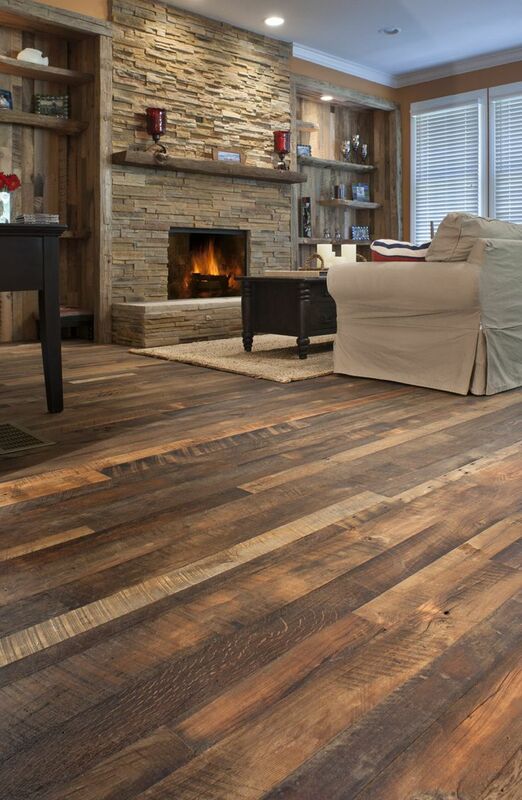 Some wood flooring is extremely green-friendly – look for wood certified by the Forest Stewardship Council (FSC). Cons: Wood does not respond to dampness or humidity well, and can warp, discolor, or shrink, although some finishes may have less problems with this. Cost installed: $8.00 to $12.00 per square foot, depending on the type of wood, project size, and your home’s location. ROI: When you install quality hardwood floors for the right property, your ROI will be around 75%, depending on the total cost of the project and your property location. If you like the look of hardwood but don’t like the price tag, or you’re concerned about putting it in a room where moisture might be a problem, luxury vinyl is probably your next best option. Vinyl floors have been around forever, but “luxury vinyl” is a relatively new subset of the vinyl market that refers specifically to a high-quality vinyl which is designed to be extremely difficult to tell apart from whatever it’s mimicking, be it hardwood, tile, or stone. Pros: Vinyl is easy to clean, comfortable to walk on, stain-resistant, and holds up well to wear. Cons: Up close, even the best luxury vinyl still looks a bit like vinyl. Cost installed: $4.00 to $5.00 per square foot, depending on the brand. Carpet sales continue to make up more than 60% of flooring sales in the US. The most popular of the carpet styles today is called “cut and loop”, because of its unique ability to create a patterned, geometric look without the shagginess or over-conservatism of yesteryear’s carpet. These days, companies like Shaw Floors focus on creating cut and loop carpets which are particularly soft, forging ahead from the days when all new carpet felt like it was held together by Aqua Net Hair Spray. Other companies focus heavily on designing environmentally-friendly, toxic-chemical-free carpet and padding. Pros: Cut and loop carpets provide visual interest and tend to fit in well with design trends today, which focus heavily on texture. They are soft and comfortable to lay on, which makes them (like all carpet) a traditional choice for bedrooms and sitting rooms. Cons: Cut and loop carpets are made from fibers which are partially cut and partially looped, and when the cut fibers get bent or flatten (as with any normal use), the carpet can look more worn than it actually is. 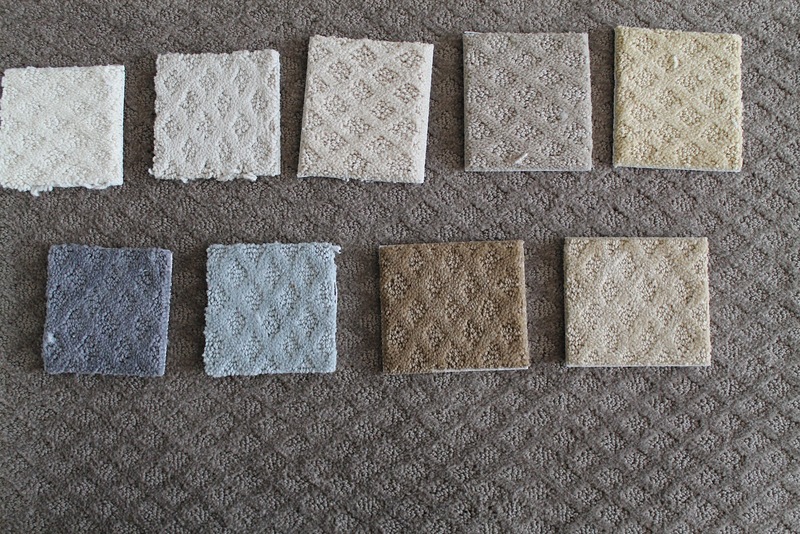 Cost installed: About $2.00 to $5.00 per square foot, depending on the quality of the carpet and padding chosen. A surprising choice with a host of benefits, cork is harvested from trees in Southern Europe, which then regrow what they’ve lost to produce more cork. 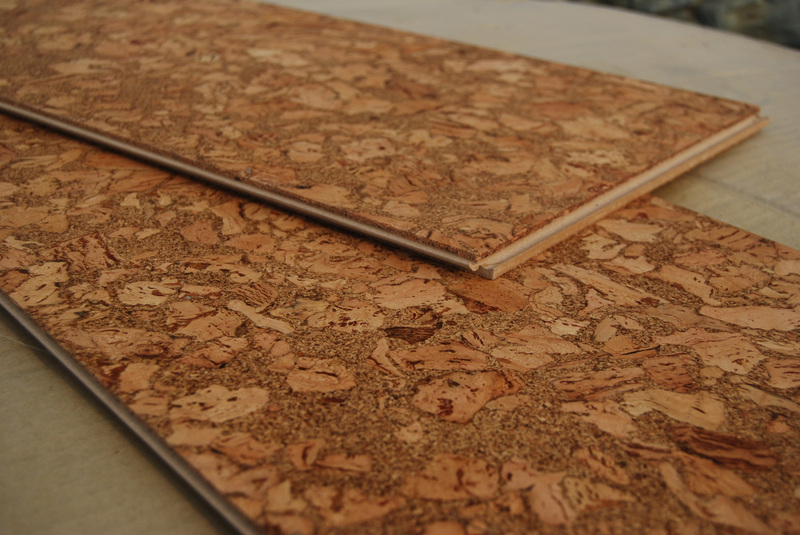 As a result, the process of harvesting cork is completely sustainable, and using cork in home design is a trend recommended by the Environmental Protection Agency. 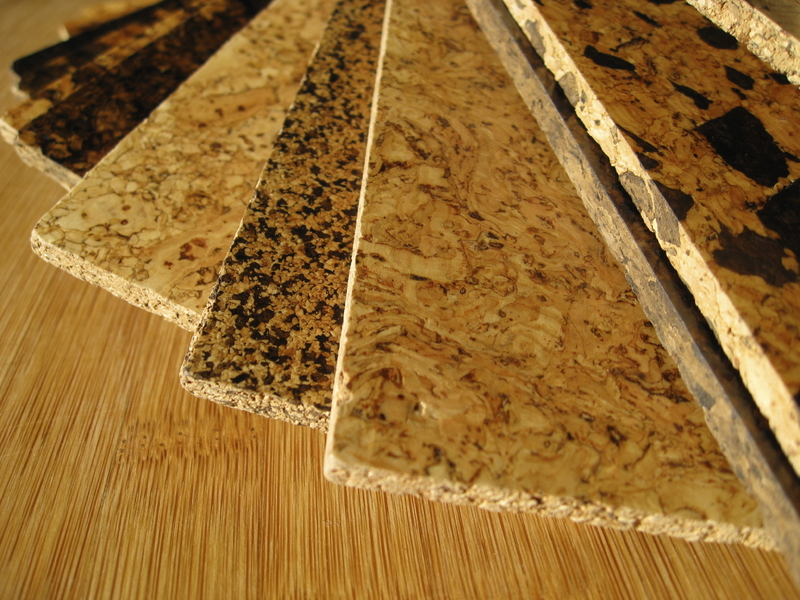 Cork comes in a variety of patterns and colors and can even be made to mimic wood grain or marble. Pros: Cork flooring is extremely supportive of your feet, making it a good choice anywhere you have to stand a long time, and it holds heat well, unlike cold tile or vinyl. It absorbs sound so well that it is often sold primarily for these acoustic properties, which can help quiet the sounds of an instrument, an active toddler, or other loud noises. It’s very low maintenance, and scratches or dents tend to disappear into the overall pattern of the floor. Cons: Cork can be stained by oil or other substances, making it less than ideal for the kitchen. Also, it must be sealed every 5 to 8 years to stay waterproof. Cost installed: About $3.00 to $8.00 per square foot, depending on if you install yourself (many varieties are easy-installation). Ceramic tile is perennially popular, and this year the trend is so-called “large format” ceramic tile: tile that comes in sizes larger than the traditional 12” by 12”. The larger size means less joints and therefore less grout to keep clean. Particularly popular is “modular” large format ceramic tile, which consists of large rectangles. Tile also is now available digitally printed, just like vinyl, which means that it can take the appearance of wood or even fabric. Pros: A classic in kitchens and bathrooms, tile is wear- and moisture-resistant. Cons: Tile can crack or break if something heavy is dropped on it, and it can be hard to replace. The grout used in between tiles can stain. Once a mainstay only of lowly basements and garages, polished and stained concrete has suddenly become a luxury flooring choice. Since concrete is probably already in place in many buildings, it can be a very cost effective option when compared to installing whole new materials. And it can be dyed and finished in a multitude of ways. Pros: Using existing flooring rather than buying new materials is practically the definition of sustainable. Concrete requires very little care other than some mopping here or there, and can look nice for literally decades. Cons: Concrete is uncomfortable to sit on! It also doesn’t retain heat well. These facts make it best for a room designed for looks rather than comfort. Cost installed: The cost of concrete flooring depends heavily on the complexity of the project. $2.00 to $6.00 per square foot will get you a basic polished concrete floor. $5.00 to $8.00 will get you scoring and additional design elements such as more color. $8.00 to $15.00 and higher will result in elaborate designs or stenciling with advanced coloring. 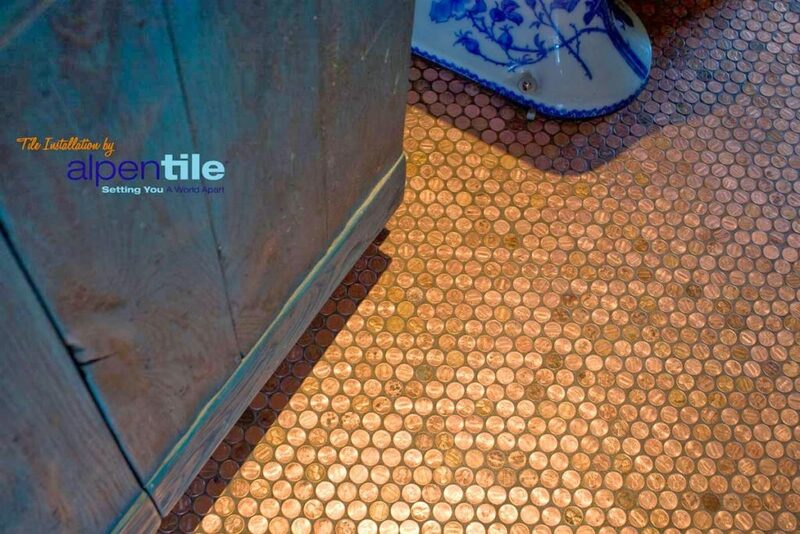 For the DIY crowd looking for their next project, you can’t possibly pick a project that will save you more money than creating your own copper penny flooring. Sweeping the Internet design corners like Pinterest and even on the cover of magazines, using pennies and epoxy to create a high-sheen and unique flooring option – say, in a formerly boring entryway – just makes good cents. Good tutorials can be found here, here, and here. Pros: You can’t imagine a more durable, wear-resistant surface, or a more creative one – your floor will definitely be a talking point. Cons: Obviously, this is a labor-intensive option, especially if you stick the pennies all one by one. 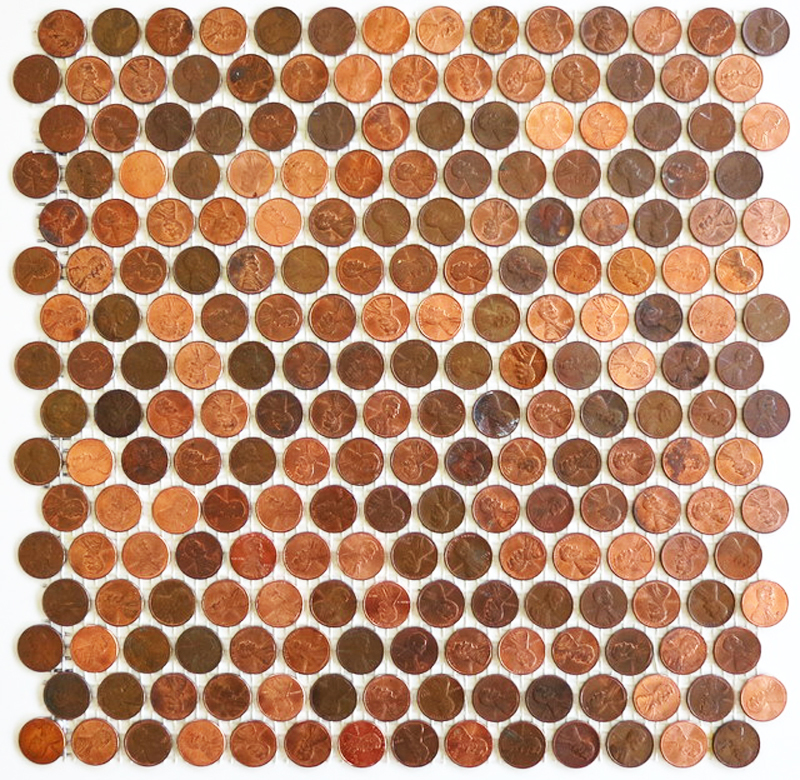 It may be nigh on impossible to get all of the pennies equally shiny, even with a good vinegar scrub, so you may have to live with an uneven patina, or spend hours searching for clean money. Cost installed: Depending on how tight you lay the pennies, you can squeeze a maximum of about $2.78 worth of pennies into a square foot, so that will be your upper limit on the cost of the pennies themselves. Installation materials may vary: you can lay them one by one, stick them to bits of self-sticking fiberglass, or glue them to a mesh, to create a sheet of penny tile, which can then be laid side-by-side. Finally, you’ll cover the whole thing with epoxy for a glossy sheen. So, your total costs will be the cost of the pennies, plus the cost of mesh or fiberglass sheets if you’re using them, and the cost of the epoxy you use. A great way to mimic more expensive flooring without actually paying for it, laminate can imitate hardwood, tile, or stone. Laminate consists of dense fiberboard with a glossy surface which protects a digital photo of whatever surface you’re imitating. In fact, nothing is quite like laminate for its glossy sheen. 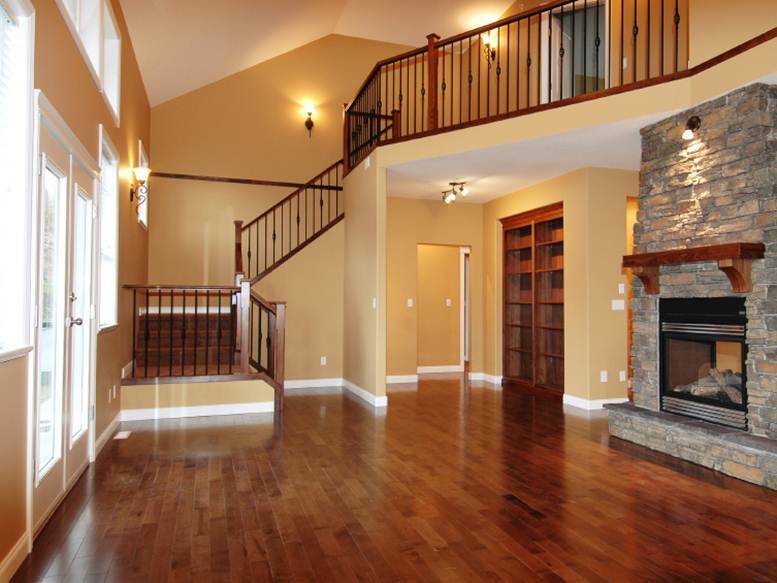 Pros: Laminate resists staining and fading, and installs easily. It doesn’t harbor allergens and is sturdy enough to stand up to most pets. Plus, it’s green-friendly: it uses far fewer trees than real wood and it can be recycled when it’s past its prime. Because it merely mimics the look of something, it can be used to give the appearance of exotic materials without actually digging up the earth for them. Cons: Laminate floors produce a hollow sound when walked on, which is a sure giveaway that the floor is not real wood. Furthermore, when laminate gets damaged, it must be replaced – it can’t be repaired like other surfaces. Cost installed: $3.00 to $7.00 per square foot. Often confused for vinyl or laminate, linoleum is truly its own surface: a completely all-natural material made of renewable resources like linseed oil, tree resin, cork dust, recycled wood flour, mineral pigment, and a jute or canvas backing. These environmentally-friendly ingredients, along with linoleum’s other natural benefits, have caused a new generation of people to give a second look at linoleum, once considered a cheesy surface only suitable for commercial settings. It comes in sheets or tiles, in a variety of colors and patterns, and especially lends itself well to the kind of vibrant colors that other flooring surfaces can’t hack. Pros: Linoleum is renewable, durable, fire-resistant, recyclable, allergy-friendly, antistatic, and contains no VOCs (harmful chemicals that many other flooring materials give off). It is also quiet and comfortable to walk on, and retains heat moderately well. Cons: The quality of linoleum is highly variable from product to product, and some kinds wear and scratch easily. Sheet linoleum must be installed by a professional. Cost installed: $4.00 to $8.00 per square foot. Historically a choice mainly for garages, rubber is seeing a surge in use in the rest of the house, particularly in high-traffic areas like kitchens, bathrooms, and entryways. Rubber is available in sheets or tiles and in almost as wide a variety of colors and patterns as linoleum, but unlike linoleum, rubber is typically a bit thicker and makes a great insulator, helping to cut back on heating and cooling bills. Pros: Rubber is extremely durable and does not soak up water or burn. 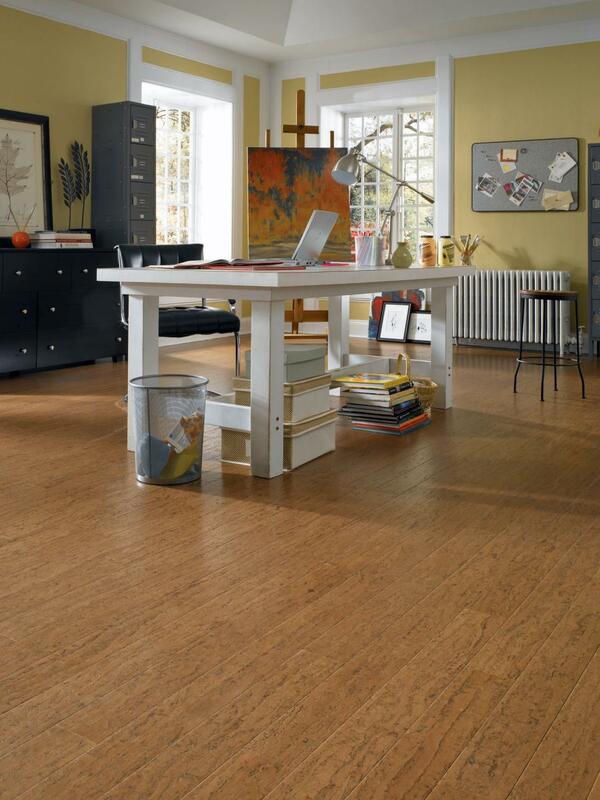 It feels great to walk on and is slip-resistant – a nice plus for the clumsier folk among us. It resists the buildup of germs and allergens. It is easy to install yourself and to repair when needed. Best of all, rubber is a sustainable resource that is easy to recycle. Cons: The dull finish of rubber is unattractive to many people. It is easily stained by grease and is not very easy to clean. Most rubber has a slight odor that can linger for a long time. 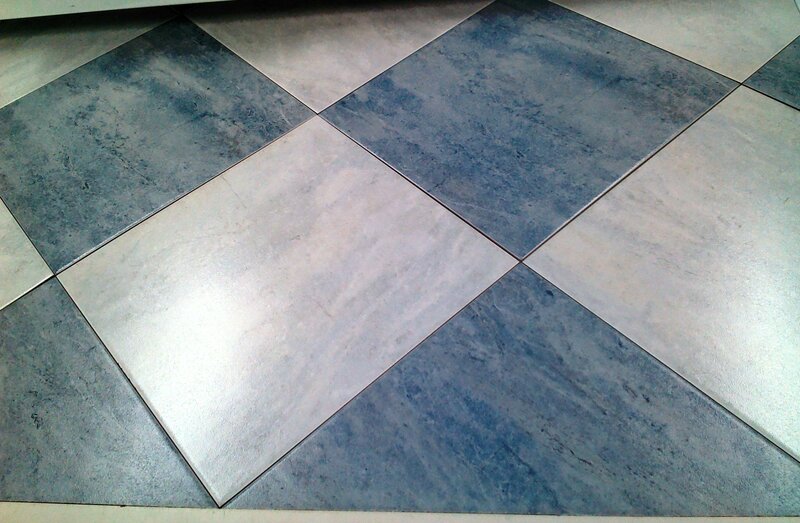 Cost installed: Anywhere from $2.00 to $15.00 per square foot, depending heavily on quality and thickness. 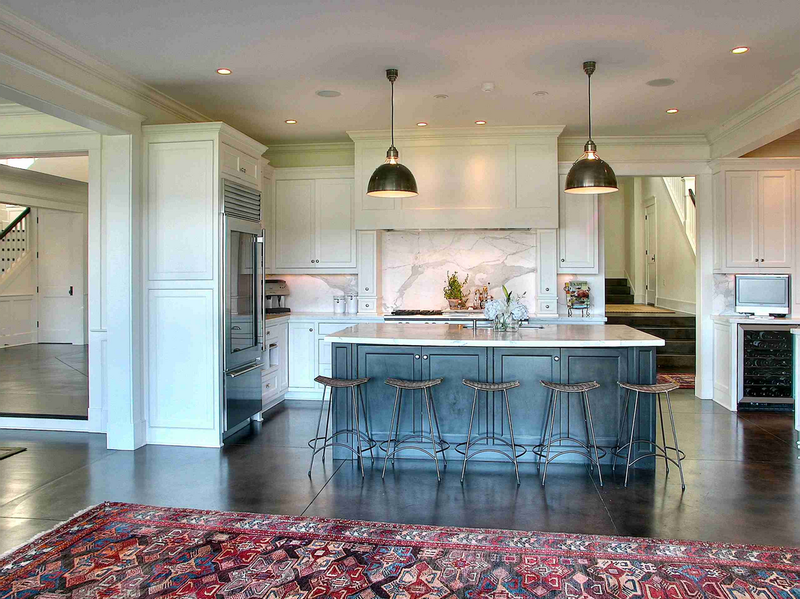 Natural stone flooring in homes is almost always one of four types of stone: marble, granite, slate, or travertine. (Other types, like limestone or sandstone, exist, but these four dominate the market.) One of the few materials that looks as good in outdoor areas as it does indoors, stone’s appeal is timeless, and goes well with nearly any design trend. 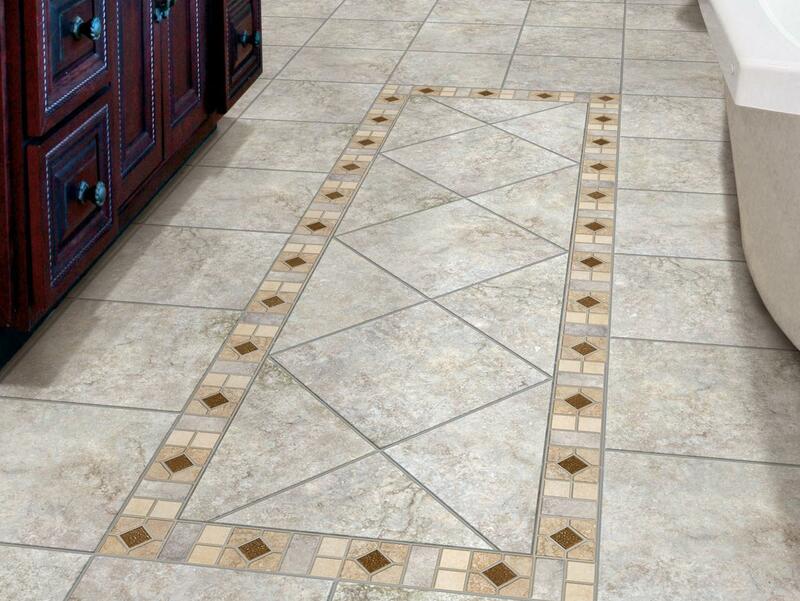 Since these stones are natural, each piece looks unique, unlike the somewhat cookie-cutter appearance of flooring choices like vinyl or tile. 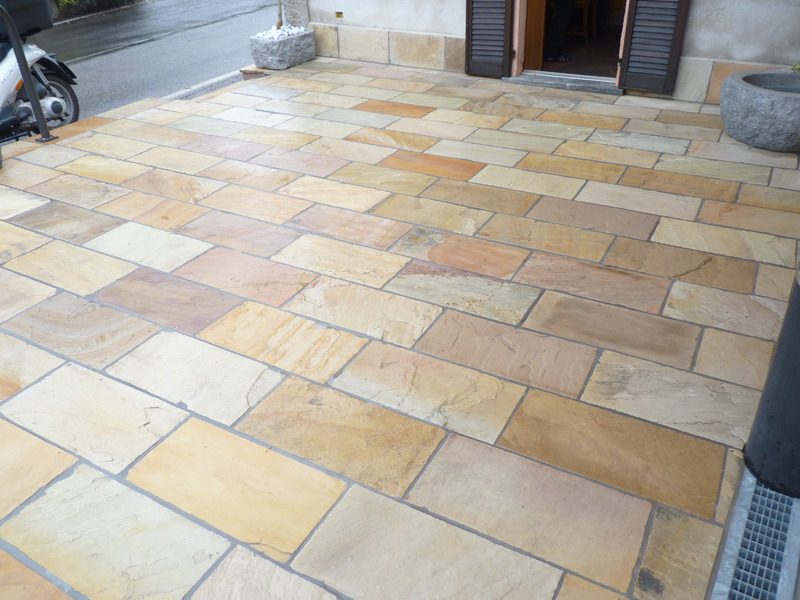 Pros: Stone is incredibly strong and durable, and thus requires very little maintenance. Stone also stays naturally cool to the touch, a plus in warm climates, especially in the summer. (If you live in a cold climate, stone isn’t immediately ruled out, either: it conducts heat well, making it a great choice for radiant heat systems.) 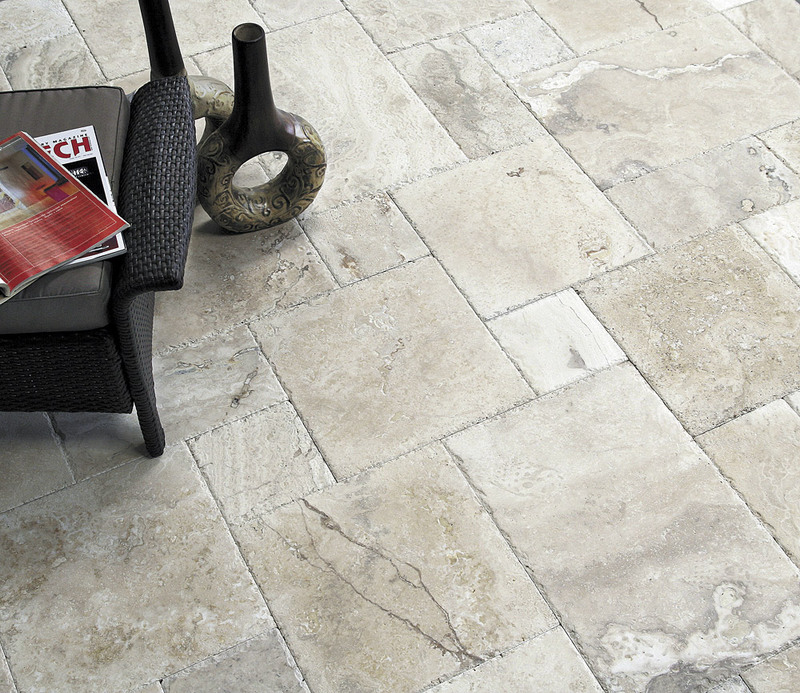 Travertine in particular is soft and feels great underfoot. Cons: Wet stone is slippery and can lead to falls if used in areas like bathrooms without mats. Plus, those falls might be more dangerous, since stone is unyielding – and any vase that falls from a shelf is likely to break. Stone in general is expensive and heavy and requires professional installation. Marble and travertine are both prone to staining if not treated properly. Cost installed: Granite is the cheapest natural stone of the four main options, running between $3.00 and $15.00 per square foot. Slate runs between $5.00 and $20.00 per square foot, depending on its density. 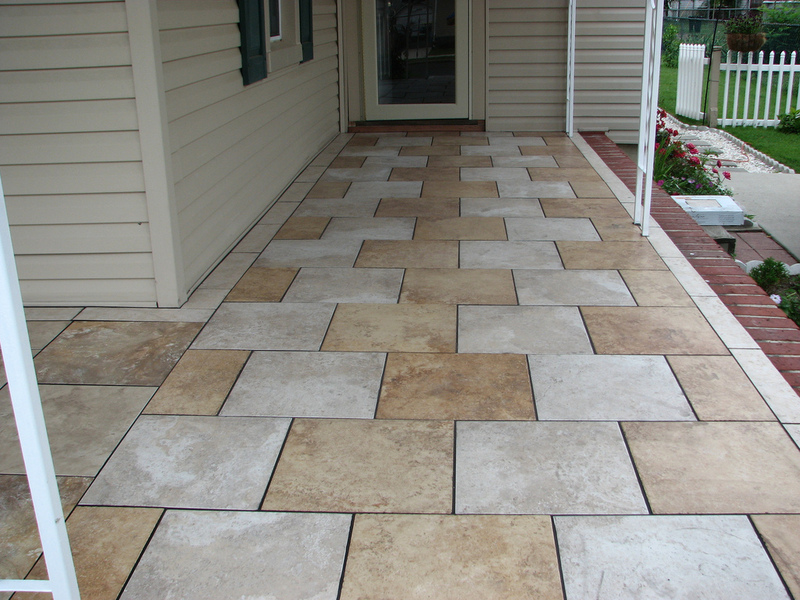 Travertine can run anywhere between $5.00 and $40.00 per square foot. Marble can run between $5.00 and $50.00 per square foot. Another great DIY project, useful in a variety of situations, painted plywood is a great, incredibly-budget-friendly way to make a formerly drab room sparkle. Many flooring options – like hardwood and tile – require a perfectly level surface to install over. Stone requires serious under-support because it is so heavy it can break through regular flooring. And carpet can be very expensive, especially if you go green-friendly. So if you’re renovating an older house — one with typically unlevel surfaces, odd nooks and crannies, and other problems – rejoice if you pull up some old tile or vinyl and find existing plywood flooring underneath. Painting those planks can result in a beautiful, budget-friendly, trendy new flooring option. See a great tutorial here. Pros: This is one of the cheapest available flooring options, even when you go with extremely high quality, high gloss paint. (Make sure you seal it with polyurethane sealer, though; otherwise water or sun damage or paint chipping could become a problem.) Plywood is quite hard and durable when properly sealed, and only requires the occasional sweeping or light mopping to keep clean. Cons: If you paint the floor a single color – as you are likely to do – then the uniformity of the surface might result in every speck of dirt being visible. Plywood seams (between planks) may also be visible, which may or may not bother you. The biggest problem is that there is at least one state (Virginia) where you cannot sell a house with bank financing without some sort of covering over the subfloor. If you’re fixing up to sell, make sure you ask your real estate agent about this. Cost installed: Since you won’t likely be actually installing anything, the cost of this project is just the cost of paint and cleaning supplies – about $0.50 per square foot. That amount goes up if your plywood is in bad shape and you need to add a layer of good-quality plywood over the stuff, but it’s still remarkably cheap. Epoxy resin is a mix of chemicals and silica sand that combine to make a glossy, non-porous, non-flammable surface when poured over existing concrete. Long a staple of commercial applications, epoxy flooring has started to become popular in residential design as well, particularly in garages, workspaces, basements, and home gym rooms. It performs best in areas of high-traffic that need to be able to withstand chemical spills or heavy objects falling over time. Pros: Epoxy is easy to clean – just give it a sweep – and is highly resistant to just about anything you could drop on it: oil, bleach, gas, you name it. In fact, it’s resistant to just about everything: heat, water, germs, and pollen are other things epoxy doesn’t hold. Because of all this resistance, it has a fantastically long lifespan, and even serves the double purpose of protecting the concrete underneath it from moisture and cracking. Cons: The biggest problem with epoxy is that actually installing it is a bit of a pain. The mixture must be created exactly according to the directions, or it won’t cure properly. The floor must be perfectly clean before having epoxy applied. And epoxy resin takes a long time to cure — it has to be left completely alone for at least 24 hours and sometimes much longer. It also needs to be installed when the temperature is between 50 and 80 degrees and the relative humidity is below 80%, or it may not cure correctly. Cost installed: Professional installation typically runs between $3.00 and $12.00 per square foot. However, many epoxy kits available for purchase are designed for the DIY’er and run between $50 and $600, depending on the size of the room you plan to floor, and the type of epoxy. A typical two-car garage kit, for instance, would cost between $240 and $36. Engineered wood is a product consisting of several layers; the outer layer is usually a thin veneer of hardwood, and the inner layers are made of plywood or fiberboard. 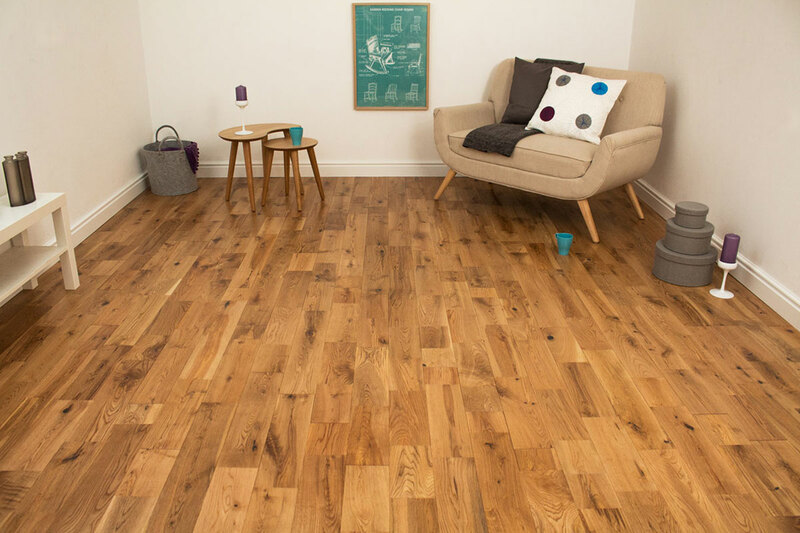 This gives the final product the look of hardwood, with more moisture-resistance and less cost. Pros: Engineered wood is easier to install than hardwood, and can be done DIY if you’re handy. As mentioned earlier, it’s much more moisture resistant than regular hardwood and won’t split or swell as easily as a result of spills. Also, it’s slightly more sustainable than regular woods, because of the way it is cut: veneer is sliced rather than sawn, which means no saw dust is produced – meaning every bit of the wood can be used, without waste. Cons: Unlike real hardwood, engineered wood can’t be sanded and refinished when repairs are needed, which makes fixing a large dent or scratch very difficult. You may have to tear up whole sections of the floor to fix something, and you may not be able to match the original pieces exactly. Also, cheap engineered wood tends to be very low quality, scratching easily and being more prone to moisture damage. Cost installed: $3.00 to $18.00 per square foot, depending on quality. Decent quality engineered wood usually runs between $8 and $12 per square foot. Porcelain tile is related to its cousin, ceramic tile, but has added sand in the clay mixture which results in a much stronger, denser tile. This makes porcelain tile ideal for areas that are high-traffic or unpredictable, like kitchens, bathrooms, or even outdoor areas. It’s the most popular choice of tile right now, according to at least one tile expert. Pros: As mentioned, porcelain is stronger, more scratch-resistant, and more difficult to break than ceramic. It takes years to wear down from foot traffic. It cleans very easily, and requires no maintenance. Cons: Porcelain tile is difficult to install and is not suitable for DIY, because it requires special tools. Also, where you have tile, you have grout – this means keeping grout clean, a notoriously difficult chore. Cost installed: $3.00 to $6.00 per square foot.